It was a perfectly perfect day! The sun was shining, not a cloud in the sky, but just enough breeze to keep it comfortable. 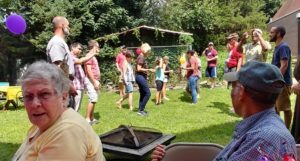 And, it was the day of the First Annual Secular Franciscan Family Picnic for the fraternities bonded to the OFM Caps of the Province of St. Augustine. God was smiling on the Friars efforts! Stepping through the archway that connects the Friary with the chapel and church was like stepping into a beautiful, prayerful oasis. 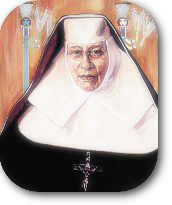 There were lovingly tended flower beds everywhere and a thriving vegetable garden that rumor has it are the handy work of Brother Andrew with the help of those new Postulants who have recently arrived. I have never seen Elephant Ears grow so large and even asked Brother Andrew if he watered them with holy water. That twinkle in his eyes and sly smile told me more than his words! Before the grill was fired up and all the side dishes brought out, Brother Kip, shepherded us into the chapel where he delivered a talk on our Rule. What a beautifully rich presentation that covered a number of pieces of our Rule but with one common theme….that we need to draw together, be a community with each other and all the branches of the family and most especially with the marginalized. Brother Kip reminded us that to achieve this oneness with God, each other and creation, we must start with prayer. Our prayer leads to love and our love leads to action. Such beautiful words to reflect on! The food was fabulous but the ‘company’ was even better. Sitting with these Friars and their friends and sharing a lot of laughs was certainly refreshing to body and soul. The fun continued with a very serious egg toss that had those of us on the sidelines cheering for both sides as each egg was caught….or not. 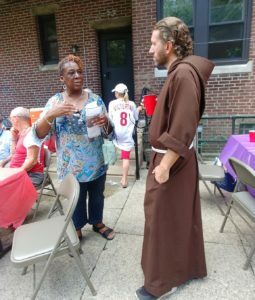 How Franciscan is that! 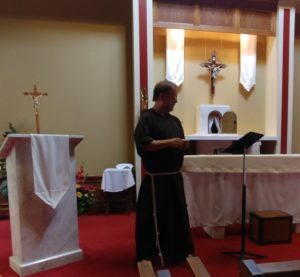 The day was beautiful on many levels, none more than the fact that it was a family gathering…..Friars and Seculars…..brothers and sisters……..no us and them, but we. We had a great time being together and isn’t that our future in a nutshell. “We” have great work to do but it won’t happen unless we are helping one another, taking each other’s hand and going forward. Help us Lord to be aware of these great opportunities to not only work as a family but act as a family. 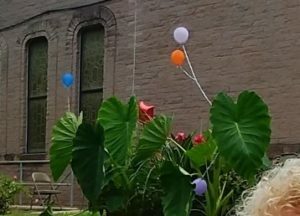 Give us the nudge we need to step out of our comfort zone and take advantage of these invitations to allow our vocation to grow and flourish – as big as Brother Andrew’s Elephant Ears! !